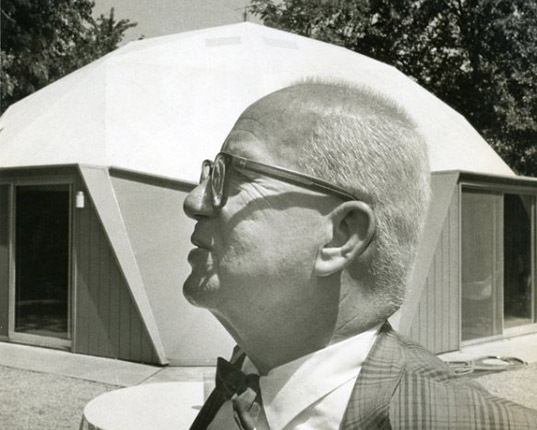 The world’s first geodesic dome house, designed by visionary 20th-century architect Richard Buckminster Fuller, is having some well-deserved physical therapy. Commencing on the day of its 54th birthday, the dome, located at 407 South Forest Avenue in Carbondale, Illinois, kicked off in April a 6-month period of restoration, with the aid and excitement of architects, builders, preservationists, and Carbondale locals alike. The dome is presently operated by RBF Dome NFP, a not-for-profit organization dedicated to preserving the dome and Fuller’s extraordinary legacy. 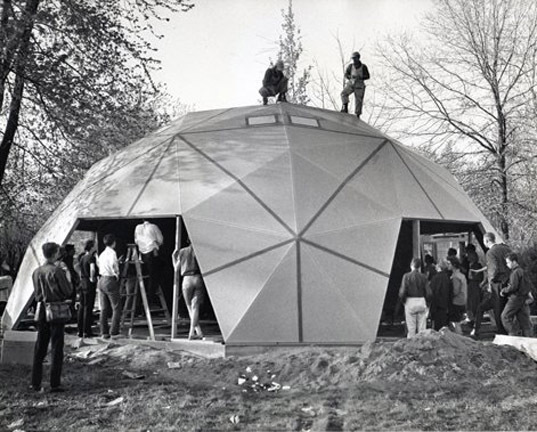 While most of us may know well that Fuller invented the first ever geodesic dome solely for housing purposes, if not for his commitment to a quality of life for everyone, he could be seen as an overachiever. In addition to having won a Gold Medal award from both the American Institute of Architects and the Royal Institute of British Architects, Fuller was also widely respected as an educator, engineer, philosopher, author, and of course, inventor. Fuller created 23 patents, was nominated for a Nobel Peace Prize, and in 1983 was awarded a Medal of Freedom, the highest form of civilian acknowledgement bestowed by the US Government. 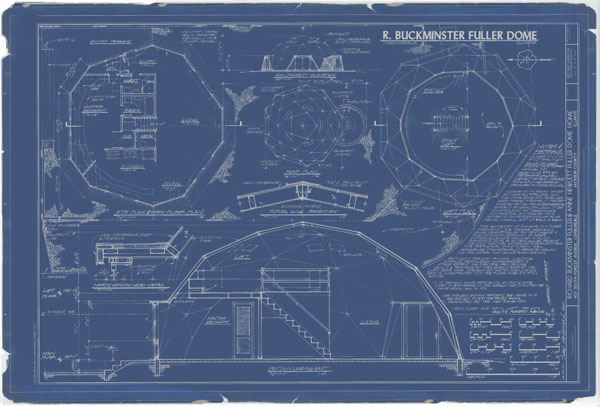 Bucky’s design for the dome was groundbreaking in many ways. It could be constructed quickly, cost effectively, and with minimal negative environmental impact. 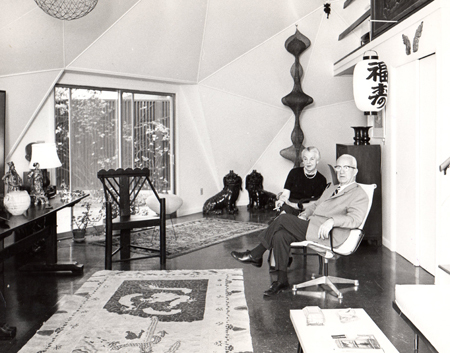 He lived in the house with his wife Anne Hewlitt-Fuller, while he was a research professor at Southern Illinois University’s School of Architecture. The dome is modest in size– as it was intended– especially when compared to today’s “choose your size” homes. The dome measures about 39 feet in the widest plan dimension and 16’-6” in height at the highest point. The shell is comprised of 60 isosceles-triangles (a triangle with at least 2 equal sides) made essentially of simple plywood panels (or glass lites.) The only straight-up vertical surfaces of the dome are as needed to frame the door openings. Building the original domed reportedly took all of a day- now that’s teamwork! It should be no surprise that Fuller, being such a forward thinker, is also considered by many a constructive scholar, the grandfather of the green movement. 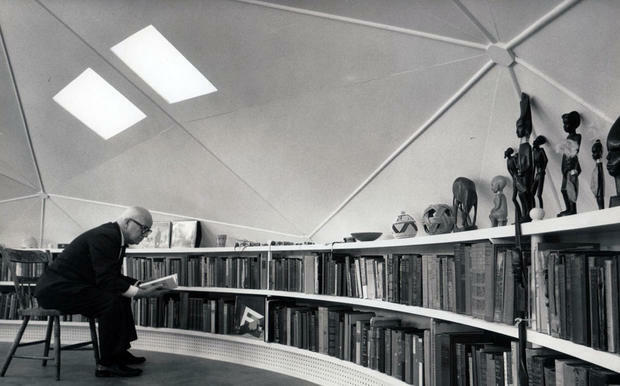 Bucky’s dome was considered ahead of its time in sustainable design, with features used today such as radiant floor heating, cork flooring (a renewable material), and natural cross-ventilation. The Fullers are right at home in the world’s first geodesic dome. A built-in after this writer’s heart—plenty of room for all your stuff! The restoration work will done in phases and upon completion will be a living museum and interpretive center dedicated to preserving the goals and philosophies, and personal artifacts of the Fuller during the years they lived in the dome. Through a successful amendment to the zoning ordinance - and to us, this is the best news – the museum may be used for meetings and receptions, as well as a bed and breakfast.